Growing up in Calgary as the middle of three boys, George “wanted to be in the NHL or to be an archeologist,” he recalls. By his teens, he had discovered boxing, winning the Golden Gloves Championship of Alberta and a silver medal in the Alberta Games. In grade 11, when a fight resulted in expulsion, George decided to pursue professional boxing. And at 17, he hitched a ride to California to embark on an epic adventure. “I was a sparing partner to Ray ‘Boom Boom’ Mancini and had 13 fights under my belt in the first month.” A trip to Houston led to work on a fishing boat in Greece, before he eventually returned to Calgary and secured a job working as a movie theatre usher. 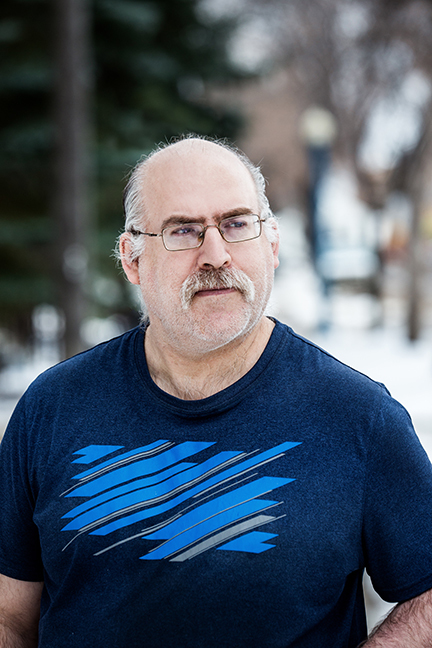 George, now 52, has been at McCauley Apartments for 15 years and is grateful for what the supportive living environment provides. “We can come down to the e4c office to have coffee and meet with other tenants. And the staff are really good at looking after us – they even organize outings.” George explains that he feels safe in McCauley, something that has allowed him to explore his own creativity, including writing poems – which he shared at the recent McCauley 20th anniversary celebration.